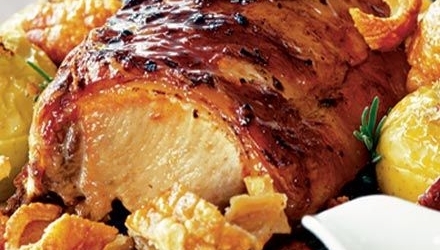 Spiced Apple Pork Roast is a slow cooker recipe with applesauce. Place the roast into the crock pot. Pour the jar of apple sauce over the roast. Remove roast, slice and serve over mashed potatoes. If desired, after roast is removed turn crock pot up to high and whisk in the slurry of corn starch and water into the juices and cooked applesauce to make gravy. Cook on high until desired consistency.